What are you thoughts on mixing black & blue? For me, it's a no-brainer! It creates a gorgeous look. 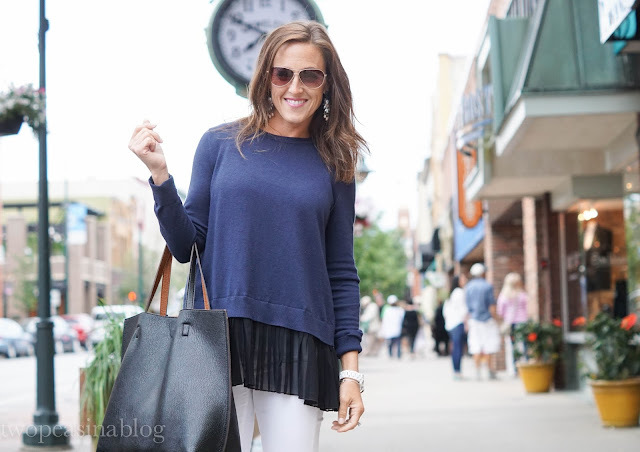 A few weeks back when the BIG Nordstrom sale was going on, I snagged this stunning pleated hem sweater. As soon as I saw the back pleats I was sold! As we were planning our trip through Northern Michigan, I knew this would be a great sweater to pack. On our stop in Traverse City, it was a cool evening so a sweater and jeans were just right. How cute is the city with the boutique-lined streets!? 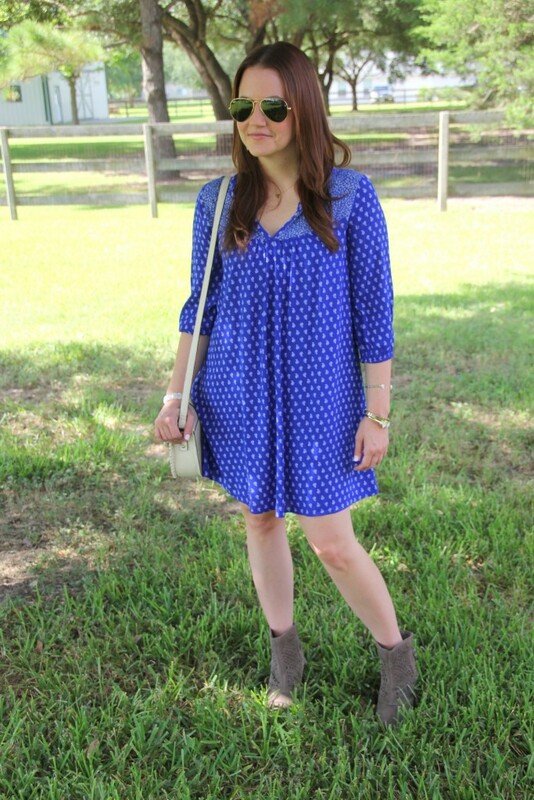 One of our favorite looks from last week's 'Tuesday Fashion Party Link-up' was from Karen of Lady in Violet! We adore her fashionable pair of booties with that gorgeous blue dress. It's such a fabulous way to transition into Fall. Now on to this weeks Link-up! Love black and blue together - what a pretty sweater! Thank you! So glad I bought it at the sale! It's incredibly soft. I can be picky with sweaters - many are too itchy for me. Thanks so much for the feature today!! It was a fun morning surprise! I'm loving your top today, I love that the back is unexpected but so pretty! Absolutely! You always have great looks! The back of the sweater was definately a selling point. Love unique details like that! Thanks so much!!! I'm sure it will be on repeat this Fall/Winter! I am also a fan of black and blue together. That top is FAB!! Thanks!! I think itt's such a pretty color combination! Love black and blue together! What a gorgeous top! Love that top! It will be so perfect all through fall. It looks really great with your white jeans. Thanks Amy! I thought pairing it with the white jeans was perfect for transitioning into Fall. That top is sooooo gorgeous on you - love the romantic vibe! Awww! Thanks Rebecca! The ruffled hem does give a girly touch to a simple sweater. Love that unique detail. That top is so cute and unique! Thanks Allie! Yes! I love the uniqueness of it and that it stands out. Plus, it's really soft! I love black and blue together! It looks great! Thanks Amy! Me too! It's a chic color combo. That sweater is the cutest! I need it for work. I can add a statement necklace & go! the pleated detail is so pretty! Thank you so much for hosting this link-up! Loving the black and blue combination. Also, loving your hair! So pretty. White jeans are my favorite - always so chic! Love the fun top! I do like wearing black and blue together. Such a cute look, I love the layered look. Love this top! Black and blue look great together! love the top with the open back! I love this top with interesting detail on the back. Fantastic! I love this sweater - so chic!! I am all about mixing black and blue in my outfits!! I am still a little weary about the black and brown combo though... :D Thanks for linking-up with us last week on the Style Saturday link-up!